The new post-apocalyptic collection by master anthologist John Joseph Adams, featuring never-before-published stories and curated reprints by some of the genre's most popular and critically-acclaimed authors. 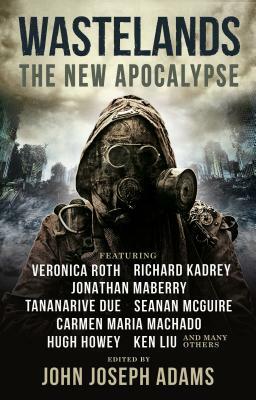 In WASTELANDS: THE NEW APOCALYPSE, veteran anthology editor John Joseph Adams is once again our guide through the wastelands using his genre and editorial expertise to curate his finest collection of post-apocalyptic short fiction yet. Whether the end comes via nuclear war, pandemic, climate change, or cosmological disaster, these stories explore the extraordinary trials and tribulations of those who survive. Featuring never-before-published tales by: Veronica Roth, Hugh Howey, Jonathan Maberry, Seanan McGuire, Tananarive Due, Richard Kadrey, Scott Sigler, Elizabeth Bear, Tobias S. Buckell, Meg Elison, Greg van Eekhout, Wendy N. Wagner, Jeremiah Tolbert, and Violet Allen--plus, recent reprints by: Carmen Maria Machado, Carrie Vaughn, Ken Liu, Paolo Bacigalupi, Kami Garcia, Charlie Jane Anders, Catherynne M. Valente, Jack Skillingstead, Sofia Samatar, Maureen F. McHugh, Nisi Shawl, Adam-Troy Castro, Dale Bailey, Susan Jane Bigelow, Corinne Duyvis, Shaenon K. Garrity, Nicole Kornher-Stace, Darcie Little Badger, Timothy Mudie, and Emma Osborne. Continuing in the tradition of WASTELANDS: STORIES OF THE APOCALYPSE, these 34 stories ask: What would life be like after the end of the world as we know it? JOHN JOSEPH ADAMS serves as series editor of Best American Science Fiction and Fantasy and is the editor of more than thirty anthologies, including Wastelands and The Living Dead. Recent books include A People's Future of the United States, Cosmic Powers, Press Start to Play, Loosed Upon the World, and The Apocalypse Triptych. Called "the reigning king of the anthology world" by Barnes & Noble, John is a two-time winner of the Hugo Award (for which he has been a finalist twelve times) and an eight-time World Fantasy Award finalist. He is also the editor of John Joseph Adams Books (an imprint of Houghton Mifflin Harcourt) and the digital magazines Lightspeed and Nightmare, and is a producer for WIRED's Geek's Guide to the Galaxy podcast. Find him online at johnjosephadams.com and @johnjosephadams.